SAN FRANCISCO (AP) — After building a social network that turned into a surveillance system, Facebook CEO Mark Zuckerberg says he’s shifting his company’s focus to messaging services designed to serve as fortresses of privacy. It’s a major bet by Zuckerberg, who sees it as a way to push Facebook more firmly into a messaging market that’s growing faster than its main social networking business. It might also help Facebook ward off government regulators, although the Facebook CEO made clear that he expects the company’s messaging business to complement, not replace, its core businesses. Facebook grew into a colossus by vacuuming up people’s information in every possible way and dissecting it to shoot targeted ads back at them. Anything that jeopardizes that machine could pose a major threat to the company’s share price, which would also affect its ability to attract and retain talented engineers and other employees. In a Wednesday interview with The Associated Press, Zuckerberg predicted Facebook’s emphasis on privacy will do more to help the company’s business than hurt it. While most of the stock market slipped in Wednesday trading, Facebook’s shares gained $1.25 to close at $172.51. The Facebook CEO has been telegraphing some of these changes to investors for the past six months, but his Wednesday blog post is the first time he has explained the idea to the more than two billion people that use Facebook’s services and look at its ads. Those ads are expected to generate $67 billion in revenue this year, according to the research firm eMarketer. If everything falls into place, Facebook will also display similar advertising on the privacy-protected messaging services. Those services are also likely to offer other moneymaking features, such as a digital wallet, as Facebook attempts to build something similar to Tencent’s popular WeChat service in Asia. That’s far from proven. While Facebook has already tried to show ads in the Messenger app, it’s seen only limited success. It hasn’t even tested the concept in WhatsApp since it acquired that service for $22 billion in 2014. “There are some huge unknowns about how successful Facebook is going to be rolling advertising into a more private messaging environment,” said eMarketer analyst Debra Aho Williamson. Some critics are convinced that Facebook has become so powerful — even a threat to democracy as well as to people’s privacy — that it needs to be reined in by tougher regulations or even a corporate breakup. “I see that as the goal of this entire thing,” said Blake Reid, a University of Colorado law professor who specializes in technology and policy. He said Facebook could tell antitrust authorities that WhatsApp, Instagram Direct and Facebook Messenger are tied so tightly together that it couldn’t unwind them. 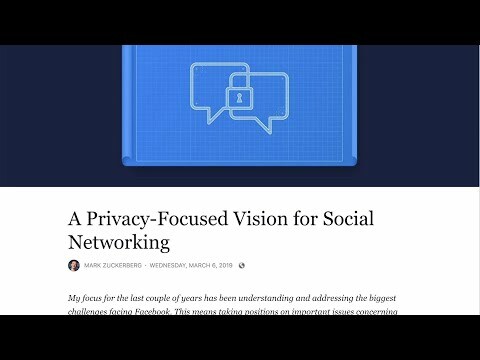 Facebook’s focus on messaging privacy raises other concerns. Messaging apps have in the past helped fake news and rumors spread fast, sometimes with deadly consequences. A report from University of Oxford researchers last year found evidence of widespread disinformation campaigns on chat applications like WhatsApp. In one particularly brutal example, the Indian government last year accused WhatsApp of fueling rumors that led to lynchings and mob violence that wounded dozens. Facebook responded by restricting the number of groups to which a message could be forwarded and labeling forwarded messages as such. On Wednesday, Zuckerberg said that Facebook needs to protect both privacy and safety as it encrypted messaging services, although he noted to an “inherent trade-off” between security and safety, simply because Facebook won’t be able to read encrypted conversations.